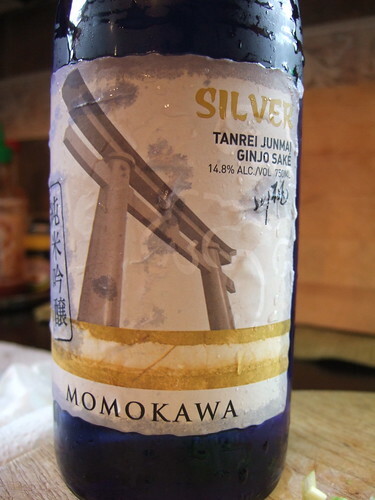 Photo: SakéOne’s Momokawa Silver Tanrei Junmai Ginjo. IMHO, Silver beats Diamond. Back in February I wrote a not-so-flattering post about a bottle of Momokawa Diamond. SakéOne’s Vice President of Marketing immediately challenged me to a rematch. Thinking I had perhaps gotten my hands on an old, tired bottle of sake, he very generously sent me fresh product. I have held back on my comments for a while because I wanted to weigh considerations such as: Does a free bottle of sake taste better than one I buy? How do SakéOne’s American-made sakes compare to Japanese sakes and how much should I expect/desire them to be similar? Do I really want every sake I drink to be a freaking satori experience or might I want to enjoy something friendly and well made? How can I induce more toji to send me sake? Enough shilly-shallying, thanks Dewey and kanpai! My first bottle of the Diamond indeed had been past its prime, God knows what had happened to it. The new bottle was better, fresher, brighter. Huge cantaloupe flavors come through and the palate is fat and pleasant. As I wrote the first time, it’s obviously a sake made with love, but I’m just not loving this sake. Here’s the detail that made me put off writing about this for a couple of weeks: I still think this sake has a nose reminiscent of wood glue (not Elmer’s, I checked). I can’t quite imagine what I would want to eat with it. Unlike the Silver, which made me think of many cuisines and dishes I could happily pair with it, the Diamond is crazymaking in its combination of big overripe fruit and an undertone of savory herbs. Verdict: Seriously, what’s going on with that nose? Dry, crisp, clean, with minerals and tart fruit, a huge mouthful of sake. Nice balance on the palate without the harshness of some dry sakes. I was amused to be reminded of the style difference between a complex and flinty French Chablis and those giant California chardonnays that can exhibit an unseemly assertiveness. While some Japanese sakes must unfold and blossom slowly, revealing layers of meaning, the Silver is a bit Brick-House-Mighty-Mighty, if you know what I mean. This is Lewis and Clark sake; that French Chablis–California Chardonnay style comparison gave me an inkling of what SakéOne means when they say they brew for the “American taste bud.” A few of us sake otaku bloggers had been debating that term, wondering what exactly it meant. I think I sort of get it when I have a giant mouthful of the Silver. It’s good sake, well made, but with a big presence. Kind of over the top, but that’s the appeal of it. If you are going to pair it with food, try the bolder, meatier Japanese flavors like grilled chicken or nabe. We drank it with plate of freshly cooked David Chang/Momofuku fried chicken (recipe at Inuyaki). The back of the bottle recommends pairing it with fish and sushi, but there’s that huge palate that can stand up to more assertive food. I think some subtler Japanese dishes might be overwhelmed by this sake. Verdict: For the price and quality, this sake is a real steal. I really liked it; I’ll drink it in the future. I don’t feel the need to sit and mull it over like I do a bottle of Kenbishi, but it drinks friendly, and what could be more American than that? Interesting! A couple of weeks ago we tried SakeOne’s MuraMura “River” – produced for the Total Wines – I’ve been wondering if it is the same sake as one of these, or if it is something entirely different. Do you have the “Pearl” (Nigori) as well? Naive girl asks: Is it common practice to rebottle the same product with a different label? No nigori. I tried three bottles of junmai ginjo, Diamond, Silver, Ruby, totally different styles. Haven’t tried the MuraMura. Could be the strange undertone taste in the Diamond is cinnamon, I couldn’t put my finger on it. I know when I get a hit of peppermint in sake, I get irritated and tense.